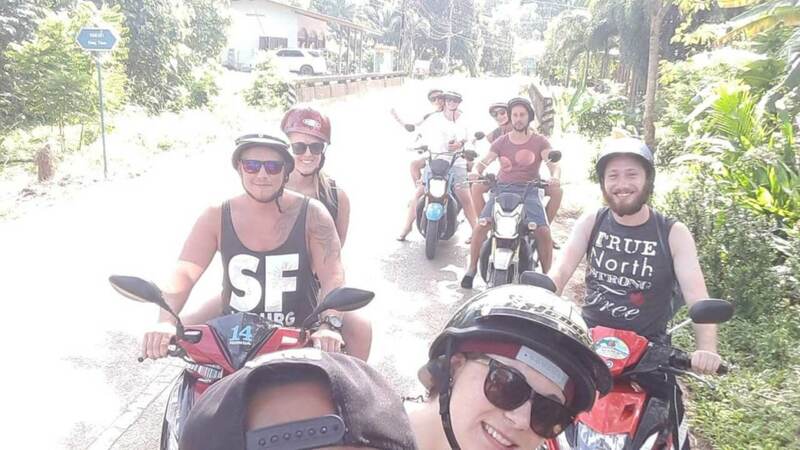 What’s better than renting a scooter and doing a beautiful trip with friends to explore the island of Koh Chang. Waterfalls, beaches, sightseeing’s and activities are waiting to be visited by you. I made a lot of scooter trips from Lonely Beach and show you two trips and routes that I enjoyed a lot. Of course there are many things to see and sometimes going off the path can lead you to some great undiscovered places. Don’t be scared to go! There are quite some places to rent a scooter in Lonely Beach. The main street has most of the places and your best chance is just to walk it. The Soy 1 also has a few places to rent a scooter. Be sure to have your passport with you as most of them only accept your passport as deposit. You can rent a scooter from up to 150 Baht but mostly you will get older or just 50cm3 Scooters. Usually you pay 200 Baht also for 125cm3. If you are two persons on one scooter I recommend to take the 125cm3 otherwise the hills can be annoying. The renting time is always 24 hours, gas excluded. You can buy gas nearly anywhere as a lot of shops offer bottles with gas. If you want to fill up the gas very cheap head to the gas station in white sands beach. Be sure to give the scooter back with the same amount of fuel otherwise they will charge you very bad prices for gas. As we are all probably no mechanics you should at least have a look at two things: tires and brakes. So check the tires if they have a proper profile. And also test the brakes if they work properly and not going to easy or hard. Also the best is to make some pictures of the scooter just in case. Route: Start your journey by driving north about 20 minutes until you reach Khlong Phrao. Nearly in the center of the town you will find the Wat Khlong Phrao on the left side of the main road. Make a stopover and have a look at this temple. After that follow the main street to the north for a couple of minutes and turn right at the sign for the Khlong Phlu Waterfall. Make a picture of the waterfall and have a cool down in the big pool of the waterfall. Don’t be afraid of the fish. From there head the main road to the south. After crossing Lonely Beach and Bailan Beach you will get to Bang Bao. Turn right to the pier. Park your scooter and walk along the pier to buy some nice souvenirs and have a little lunch at one of the food places with nice view on the sea. Back on the road drive further south. After the big curve to the left you will see an entrance on the right side. Park your scooter and go in. You can walk on the beach and search for your own nice spot. The further you go the less crowded it gets and the beach is beautiful. When you’re done head back on the road and go north again. Not far away you will find the Rasta View on the left side. It’s a nice reggae bar where you can have some food and drinks and watch the sunset with a beautiful scenery. Route: Start your journey by driving north on the main street. Stop at the gas station in white sands beach close to the north of the island. Continue until you see the hospital it’s about 40 minutes to here. From there it’s just a couple of minutes until you see the sign for the Than Mayom Waterfall. Check out the waterfall and don’t forget to jump in the pool on the upper tier. Drive further south another 20 minutes on the main road until you reach the Wat Salak Phet you can’t miss it. Have a look at the temple. Across the temple there is a little bridge on the left of the street going in the jungle. The street is not fortified anymore at one point but it’s still an easy drive. After 5 minutes you reach the entrance of the mangroves boardwalk. It’s nearly a loop so start at the right side and walk to the little pier at the end and enjoy the walk and view. Back on trek you have to go back up north on the main street again. Not far you will find the sign for Long Beach and have to turn right. After that it’s right again. Then just straight for 20 minutes until you reach the beautiful Long Beach. Have a nice meal at the restaurant at the beach and enjoy the rest of the day at this beautiful place. Be sure to head back on time, it’s a long drive. If you want to see the sunset at the Kai Bae Viewpoint you will need about 70 minutes from Long Beach. At the end of Kai Bae, which is the place before Lonely Beach if you are coming from the north, you will see the viewpoint on your way up at the right side, you can’t miss it. Enjoy the sunset. Now it’s just a 10 minute drive south back to Lonely Beach.